I've had the pleasure to have four of my Australian travel photographs published in The High Country Atlas & Guide by Hema Maps. I was approached by the publication's Editorial Assistant & Project Leader Kate Armstrong to supply a selection of four images for the publication. An image of the Great Alpine Road taken at Mount Blowhard is published on a full page. Also, an image of Mount Bogong taken at Mount Beauty, an image of the Omeo Post Office, and an image of a field just outside of Omeo. Part 4WD guide, part travel companion, The High Country Atlas & Guide will help you make the most of your time in one of Australia’s most spectacular alpine regions. The guide provides in-depth coverage of the High Country from Mansfield and Wangaratta in the west to Snowy River National Park in the east and from the ski fields at Perisher Valley in the north to Lakes Entrance in the south. It offers loads of useful information on the area’s rich history, activities and attractions to be enjoyed in all seasons. 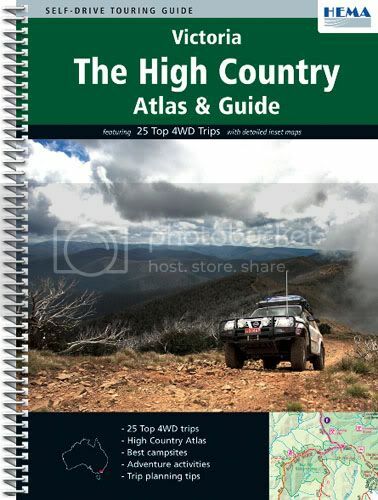 It also highlights the 25 most outstanding 4WD excursions the High Country has to offer including inset maps, track descriptions, tips, warnings and more. Along with town and supply centre information you can read about the many sights and activities available in Alpine National Park, Snowy River National Park and Baw Baw National Park. Whether you’re looking for a serious four-wheel drive adventure, a winery tour, a walking trail or a place to stay, this book with its easy-to-follow maps throughout is an indispensible companion. 1st Edition, Spiral Bound, Soft Cover, 160 pages, 215mm x 297mm. Price: $34.95.